Years later, a young woman is found savagely murdered, a pitchfork thrust through her neck, her body arranged in the shape of a star: the death pose of a witch. Someone – or something – is reviving the terror of the notorious Salem Witch hunts. And only one man – a brilliant, eccentric loner with a dazzling mind and a fascination with witchcraft – can keep the evils of the past at bay. 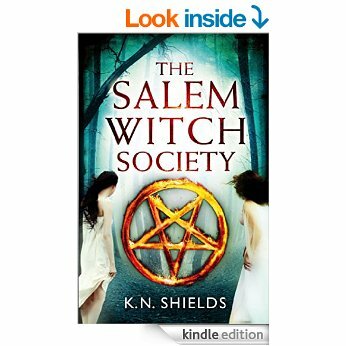 Rich in history, mystery, and witchcraft, The Salem Witch Society is a twisting, terrifying thriller – a dark fairy tale for readers who loved A Discovery of Witches and The Interpretation of Murder. Sounds good, although I didn’t finish A Discovery of Witches and I haven’t read The Interpretation of Murder, but still, these comparisons aren’t always applicable. The reviews are mixed, roughly about half and half, 27 on Amazon UK with an overall 3.6 out of 5 stars. There are just 2 reviews on Amazon US, which I thought was a little surprising considering the author is American, one 5* and one 3*. A top 50 reviewer gave it 5* and a couple rated it low because it didn’t live up to the comparison to A Discovery of Witches in their opinion. Not that that would sway me either way. This is a debut novel, and expensive for a kindle copy, whether it’s a debut or not. I like the cover, it has all the required elements for a novel about witches. The story is set in Maine in 1892 and includes black magic and murder which seems to have a connection to the Witches of Salem. I had a quick look inside and the first couple of pages seemed quite interesting but I’d have to read a little further and my five minutes were all but up. I was undecided but on reflection..
BUY or PASS? I’ll PASS. The price is too high for a punt and I’m not sure about the book even though I’m still taken with the description. The reviews didn’t convince me but I might change my mind if the price ever comes down. Had they been more positive…it could well have been a BUY! More Friday Five Challenge choices.. The price is high for a kindle edition, but the theme is one that fascinates me. If I didn’t have a TBR pile so high it would be a buy from me, I will put this on the maybe pile for later investigation. As you say, far too expensive for a punt – does look interesting but the lukewarm review situation would put me off. I think that book often don’t have many reviews simply because people abandon them, too. I thought the book cover fitted the genre and the book description sent a shiver down my spine. Sadly too many new authors try to compare their writing to wider read books in an attempt to boost sales and this is a really heavy risk which often backfires because readers then have really high expectations for the book. Best to let a reviewer say “this book compares to….” but not shout it in your own blurb. It looks like too many readers have been let down by this book and with a high price tag for this debut book it is a PASS from me too. Lower the price, change the blurb and lure readers back. I agree with the rest of you here and Cathy’s analysis so it’s a PASS from me – not good enough reviews for that price. Yep – a belated ‘pass’ from me too. Pricey and not great reviews, I’d pass.